Israel leads hi-tech, but did you know it is a major force in the US real estate world due to a highly trained group of hareidi women? Suppose you are an American businessman negotiating the purchase of a building with a small or large number of occupants, each with his own lease stretching to up to hundreds of pages of legalese for you to pore through. You also have to exercise due diligence (analysis of a company or organization done in preparation for a business transaction) for your own protection – and then make your decision. If it is positive, you have to prepare to go to title based on the above. It would seem to be a miracle that anything of that complexity is ever transacted. Yet it happens every day, because you outsource, paying for these time-consuming, savvy and comprehension-demanding tasks to be done for you. But whom can you trust? And how can you get things done professionally, efficiently and accurately, without incurring law-office fees that might make you decide to forget the whole thing? Enter Joe Rosenbaum, a US-based hareidi entrepreneur and chairman of New Jersey-based Madison Commercial Real Estate Services, who decided that the way to optimally outsource commercial real estate services is also a way to help the Israeli economy. After all, the time-saving advantage of outsourcing to Israel is obvious - US nights are regular work hours in Israel due to the time difference and an American businessman can thus walk into his office in the morning and find the answers to yesterday afternoon's questions waiting for him. But who would form the work force? Why outsource to Israel rather than other countries? Well, that's where some unique advantages come into play. Rosenbaum, in helping Israel as well as the aforesaid American businessman, also found a way to make Israel's hareidi sector more self-supporting, while promoting aliyah as a by-product. He decided that this challenge suited highly intelligent, fluent English-speaking hareidi women who had moved to Israel as youngsters or made aliyah after marriage – and "struck oil". Israel's hareidi communities are filled with young women with notable language skills (a look at the proliferation of English language hareidi women's magazines published in Israel proves that), from the USA, Canada, the UK, South Africa and Australia. They have the benefits of a religious high school and/or seminary education, live in an environment where learning and intellectual stimulation are respected, and a strong desire to help support their families. Rosenbaum opened a small office in the hareidi town of Kiryat Sefer in 2003. He created a meticulous vetting system followed by a four month intensive and demanding training course (with a stipend throughout) that sharpens serious reading comprehension skills and professional legal vocabulary while teaching all that is needed to master the great body of knowledge required to fill the three services the firm offers its clients: title insurance, lease abstracting and acquisition due diligence – to the nth degree. "At the end of the course, after mastering the manual developed by the company, the graduates can compete with – and even outdo - any law office at any price in the USA", he says. And, in fact, ten years later, these hareidi women provide top-notch real estate services for some of the biggest players in the US real estate market. And we are talking about $250 million deals in some cases. Rosenbaum, with a sizable staff in three USA offices, is the "face" of the company, the personal contact with clients and attorneys. Israel is where the heavy work gets done. Enter Eli Kazhdan, a baal tshuva (secular-turned-religious) born in Russia, raised in Boston, the son of an Israel Prize laureate in mathematics, who made aliyah in 1991 with his own degrees from Harvard and Hebrew U. Law School. Rosenbaum, who knew Kazhdan previously, asked him to join forces to develop the Israeli end as it expanded. And that is how the growing, young hareidi suburb of Modiin Illit, also known as Kiryat Sefer, became home to a thriving business operation, CityBook, that owes its name to its location. Arutz Sheva went to see CityBook in action and discovered that the idea works. The business has mushroomed. People use CityBook Services because they are good at their job, so that we found 110 young women busy at computers in an open space environment on the fourth floor of an architecturally arresting circular-fronted building, with CityBook emblazoned on its outer wall, located just as you enter the town. 'Here", says Kazhdan proudly, "is where the other advantages of this specific work force come into play. The women have a highly developed work ethic, as well as time-managing skills honed from managing growing families". "In their value system", he goes on, "'stealing' time from one's employer is considered theft. They note every drink or phone break on their computerized time clock, do not spend time on emails or surfing the internet (panned in the hareidi world, ed.)." "We have 95% retention, because they feel good about having a job that needs their considerable brain power – and we also make the work environment a pleasant one that is suited to their needs." The women work until 2:30 p.m., arriving home in time for their children. Advancement in salary, starting at 50% above minimum wage, is based on performance and achievement, with worker evaluation part of the manager's responsibilities. And the manager we met is an example. She is the wife of a Rosh Yeshiva (dean of a Torah academy), who worked her way up over a ten year period and, now that her children are grown, is in charge of 100 employees. Although demand is high, CityBook accepts only 20 applicants for each training course, looking for bright, motivated candidates. The management encourages questions and suggestions, and in fact, one of the vetting criteria is having enough self-confidence to ask them. A few words with one of the young marrieds on the floor might serve to guide Israel in understanding its hareidi population: "Client demands mean we have to work on the Intermediate Days of holidays", she said, "but CityBook runs a day camp for the children, as they are out of school. They have a 'yeshivat bein hazmanim' for our husbands during the yeshiva breaks, we have Torah study sessions on subjects such as Shmirat Halashon, contests and raffles. They even put out a coloring book called 'My Mommy's Work" made especially for the children. We feel motivated because our way of life is part of the environment here, even to being addressed respectfully as 'Mrs.­­­­ x' by our employers rather than on a first name basis." In a city where the average family size is 7 children, there are special coping methods needed. Kashdan hires 15% more employees than necessary in order to cover for maternity leaves and days off to care for sick children. Despite that, the cost to clients is significantly less than it would be in the USA. 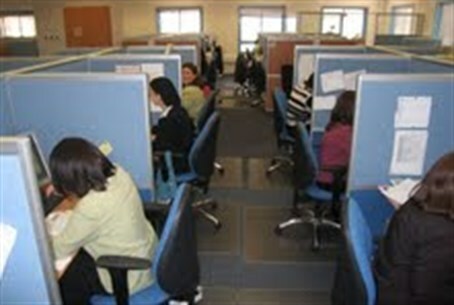 Clients reap the benefits of a uniquely competent and dedicated work force, while Israel's hareidi population contributes to the country's economy and its good name.